Estate Sale Tips to Get the Best Stuff! 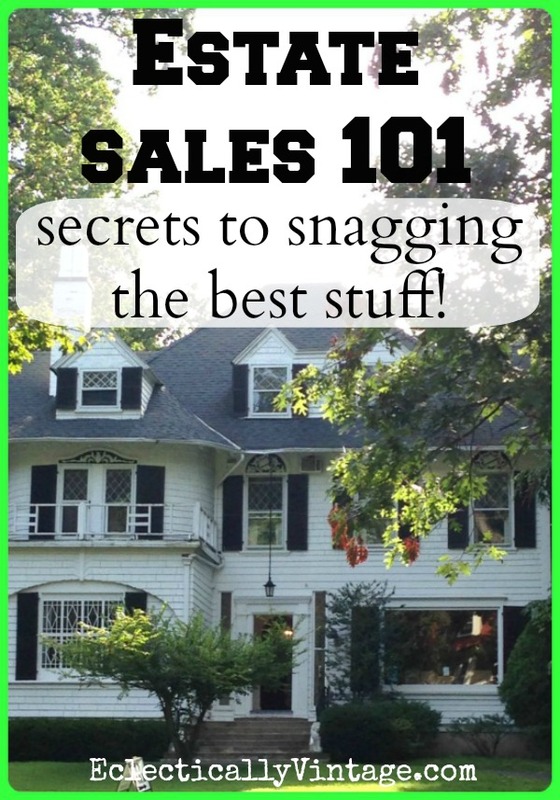 Estate Sale Tips 101 – Secrets to Snagging the Best Stuff! These estate sale tips will turn you into a pro thrifter! Learn how to get the best deals just like the antiques dealers do! you never know what you’ll find at an estate sale. Usually run by estate sale liquidators, everything is priced to sell quickly. here’s your chance to scoop up the same treasures they’re buying … then marking up to sell in their shops. 1) Start at estatesales.net – type in your state and zip code and a list of sales will magically appear. Many include pictures so you will know if it’s worth your time. Don’t forget to check your local newspapers and the Craigslist garage sale section too. 2) Map out your course – plan your trip to hit the best sales first. 3) Cash is king – most sales won’t take credit cards or checks so stop by the bank before you go. 4) Don’t bring – large tote bags or purses, they might not be allowed inside. 5) Do bring – measuring tape, a flashlight (for those dark attics and basements), room measurements and purell! Note: Check out my Cool Girls Flea Market Check List – so you’re prepared for anything! 6) Arrive early – there will be crowds, there will be a frenzy. If you want first pick, be prepared! Note: Sometimes, numbers are passed out early in the morning so get there extra early, get your number then go out for coffee but make sure you return before the sale begins. If the sale is first come, first served make sure to plant yourself firmly in line and don’t budge! 7) Early bird gets the worm – the best selection is during the first couple of hours but there will be no room for negotiating price. If you have something specific on your wish list – get there early or it will probably disappear. 8) Late bird gets the bargain – prices are slashed after the first day (up to 50%) with real bargains during the last couple of hours (perfect for those of us who don’t “need” anything and like junky stuff). 9) Do a fast walk through – go through every room when you arrive to scan for treasures and grab them quickly. Then go back to poke through boxes and bins for a more thorough search. 10) Hit the garage, basement and attic – it’s where I head first and where I find my best treasures. 11) Ask about unmarked items – appliances, draperies, rugs, garden furniture, shelving and swing sets are often for sale if you ask. 12) Bring post-its marked “sold” – if you find something fabulous that’s too big to carry, slap your post it on it before someone else can buy it while you’re searching for a salesperson! 13) No prices marked – just gather up your loot and ask for a price (you’ll get a better deal if you’re buying a lot then if you bring up each piece separately). 14) Bids – sometimes sales allow you to bid on big ticket items that aren’t selling at full price. You give them your best price and they will call you if it’s accepted. 15) Check pick up policy – some sales allow you to come back the next day for large items but others insist you remove them right away. 16) Bring muscle – estate sale workers often won’t help you to load your finds so bring help (or just bat your eyes to get other shoppers to help you). 17) All sales are final – check condition before you buy. 18) Sign up for email list – (usually by the check out register) add your name so you’ll be the first to know about new sales. 19) Respect the property and be nice – out of bounds rooms are usually marked off with tape so stay out and be friendly (you’ll probably see them at the next sale). 20) Have fun – you may come out empty handed but you can at least enjoy an inside peek into lots of very cool houses. Many estate sales are held by families of someone who has passed away. I often feel sad when I’m rummaging through someone’s possessions and wonder who will be picking through all of my “stuff” when I’m gone. I hope the family is thankful to have a company help them sort through everything while turning a little profit and knowing their possessions are well loved. Update: Make sure to read through the comments – my readers have left some of their own unique tips! Happy Hunting with these estate sale tips! See all of my estate sale and thrift shop finds here. « Previous: Decoupage How To – Drinking Glass (Waterproof & Dishwasher Safe)! I’ve been attending estate sales in Florida since the mid seventies and it seems that every year it gets more difficult to find any bargains. Most of the Florida companies that post sales on EstateSales.net price their items at prices higher than some local antique shops. Many of the companies use ebay as a guide, but they look at what the ebay sellers are asking for the item, when they should be looking at completed sales where it shows what the item actually sold for. To make matters worse, sellers refuse to negotiate prices on the first day of the sale. Some estate sales sellers offer 50% off on the last day of the sale, but many times the prices are still outrageous. I have the best luck at garage sales, yards sales, moving sales, etc., and at estate sales that are conducted by the family of the deceased. I plan to make a buying trip to some small towns in the New England area in May of next year. Hopefully prices up there will be more realistic. I have to agree. Here in Texas many of the estate sale companies have brick and mortar stores. They make a “deal” with the family FIRST for everything that is left, Then they also bring in tables and merchandise from other estate sales or their stores. I haven’t found any real bargains at one of these in years. I’ll be handling estate sales in the Dallas area start next summer and I won’t be stripping the sales. It’ll be 100% all of and only the belongings of the estate. Is that something I should use to advertise? Yes! I am in Ft Worth and am a regular estate sale shopper. I prioritize sales managed by companies who provide good prices, good pre-sale (facebook and well-listed estatesales.net listings), who recognize regulars and will occasionally cut a deal 🙂 (I’m not asking for something for nothing, just sometimes it’s nice to get a little bit off even on day one of a sale. I never *ask* on day 1 though). Great tips! I love estate sales! RE: Tip #12: In Oklahoma, we have highly organized estate sale businesses, some of whom are also antique/vintage shop owners…if you put your own “sold” post-it note on, I have seen them ask people to leave the sale and not come back. So be careful about that. One of them announces before they open the doors that “you will be asked to leave if you put a sold sign on any item”. I agree, we have a booming estate sale industry here in Oklahoma. And they are usually fairly well staffed. When I find a larger piece I must have I’ll “hover” and stake a claim by putting my purse or other purchases on it while I watch for one of the staffers and signal them to come to me. They constantly roam the sale ready to start a ticket for me and help when my hands are full so I can keep shopping. It also helps to make friends with the selling team. (Pretty easy when you see them every weekend!) It’s easier to gain the attention of a familiar face than a stranger. And when they know what you like to buy, they’ll point you to your favorite things, or steer you away if something isn’t up to snuff. I’m a DFW estate sale shopper. We have one guy who goes to all the sales, and he’s apparently been on (or still is on) Storage Wars. He is a huge jerk, who runs into a sale with a stack of post-its labled “sold” with his name on it. I’ve seen him push little old ladies aside! Thanks for that info Jan – every sale is different so be sure to ask first! As an Estate liquidator, we don’t put a sold sticker on until item is paid for, as I have had people claim an item and then not paid for it or changed their mind after the sale. That is it. The key piece of estate sale info that didn’t pop into my otherwise brilliant junk hunting mind…… post it notes for the sold alert. Genius you are. Happy hunting Jesse – let me know what you find! I haunt estate and garage sales. Most will allow a box under or by their table for you to put your items in. I get to estate sales an hour early to be one of the first 10, usually how many they let wander at a time. I look for a basket to carry my items as most don’t allow carry in bags. I’ve found if you ask the sales people stationed around to put your item by the payout area they will. Definitely go thru, look at items, like skimming a book. Get the best stuff first. Then go back thru carefully. I find I’ll find treasures I’ve overlooked. Always check out condition, sometimes you can get a lower price for damages they hadn’t noticed. Always SMELL your item, especially if fabric or paper. MILDEW isn’t always picked up in a well ventilated area. Most will allow you a reduced price if you buy multiple items, don’t be afraid to ask, but don’t be hurt if they say no on first day of sale. Last day is usually half price and they will even reduce more if you buy quantity. Good hunting! Some great ideas! I help out a friend who runs estate sales and I have seen it all! Great tips. I have actually never been to an estate sale! Everyone I work with looks like I am crazy when I say this. It is on my list, but first I must make room for someone else’s junk before I bring more stuff in here. Sharing this post, really invaluable for people who are crazy like me and love nothing more than other people’s cast offs. Never thought about flashlights and post its!!!!! Great tips Kelly!!!!! Great tips! I love a good estate sale and I am really excited about estate sale.net! When I go to an estate sale I always sign up for the companies email list. I get a direct email for future sales and can plan accordingly. Craigslist and Auctionzip.com will also list estate sales. Thanks for your inspiration! 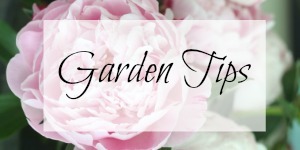 Excellent tips as always Kelly! The “sold post it idea” is one I had not thought of and will definitely use. Another thing I find very handy is a tarp and/or blanket in the car for the inevitable filthy finds or to protect anything fragile you may want to bring home. As a matter of fact I keep a tarp, blanket and wet wipes (which I prefer to Purell) in the car at all times for just this purpose! Plus you never know when you will come across a free find on the side of the road or a plant sale so it is good to be prepared! Fabric shopping bags are always in my car also and make great padding fragile items as well. Many people find these things humorous, like the fact I always have a tape measure in my purse, until they have a need and I am the one prepared! Ah yes, that was an exceptional post! ! I recall seeing it when I first started stalking, errr I mean following, you and was looking through past post! I have a reputation for finding the grungiest stuff but those have also been some of the best treasures! More than once I have been asked, where did you find that? Usually the answer is in some dark corner of a basement, garage, attic or shed. In my experience the dirtier it is, the better the price! Ahhh, Beth, a woman after my own heart! I also keep rope in the car, just in case I find a large piece of furniture and have to tie it, or the hatch, down. I drive an SUV and I keep the back matt flipped to the rubber side for just such pull-over-quick-and-grab-that instances lol. One more comment: if you live in an area with colleges, or better yet, major universities, they almost all have property dispersal warehouses where they sell off anything and everything found in a school. I have found some of my best treasures at the University of Michigan. You never know what you will find: I have seen a huge porcelain enamel shelving unit (used for incubating eggs), which would have been fantastic in a large kitchen; a 15′ long table with beautiful carved pedestal bases which must have been in an old conference room; any number of funky metal cabinets; corkboards, whiteboards, blackboards, and every kind of office chair and dining chair you can imagine. Every now and again, they have lab tables, too. I have personally purchased 2 wardrobe units, quartersawn solid oak, probably from the 20s, from the law school student rooms ($120 each); 2 very cool hexagonal mirrors ($5/each); a 36″x84″H mail cubby in robin’s egg worn paint (!) for $25! I’m adding the post-it notes to my purse tonight! Another great website to look up estate sales is http://www.yardsalesearch.com . Just type in state and zip and it will show sales in your area. Even if estate sales aren’t listed at a particular time, usually there are thorough descriptions of what’s available at the yard sales to determine if its worth the drive. Have never been to an auction or estate sale but would love to. Would be so fun to see what treasures there might be. Thanks so much for the great tips for estate sales. Think they’ll be very handy for a newbie. We live out in country so when we go to yard sales it’s a bit of driving, places can be spread out all over and hard to find. I try to get an idea before hand by going on a mapping site then I can plan a route better. Instead of putting a Post-It on an item (which the sellers may not like), simply take the price tag off the item and carry it to one of the workers. They will then handle how to best mark the item. Great tips! Here in NC most companies use tear tags on larger or more expensive items. You tear the bottom half off, take the tag to the cashier, then go back and get your items. Small items can usually be carried around in bags you bring yourself. Each company is different though, so read the policies so you are prepared. I was glad to hear that someone else feels the way I do about rummaging through another person’s things. I love flea markets and such, but I can never help getting a little sad thinking about the person that the items once belonged to. It’s always nice while you’re searching for a bargain, to think about what the item once meant to someone else. But that’s the joy of buying used versus getting something new from the store. I think it’s good to always remember to watch what you say. If you are criticizing that hideous lamp, you may not realize that you are among family members who see it as a sentimental piece that Grandma loved! 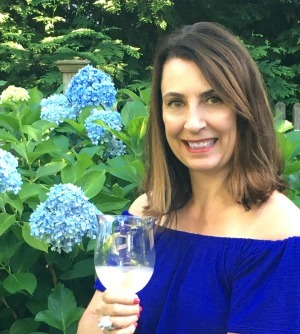 As always – great tips, Kelly! I’m pinning for future use! Have a wonderful weekend! I love estate sales and your tips are spot on! Especially the one about bringing a measuring tape! I’ve had to pass on a few things because I wasn’t sure if it would fit in my home. Another tip, bring a truck! Congrats on being featured at Wow us Wednesdays! Wonderful advice! Thanks so much for sharing your expertise! i just love estate sales and wish they did them around here. in southern illinois they do estate auctions which are still very fun! ( i did a blog post similar to yours about estate auctioning tips!!) but the con is they do take FOREVER and some stuff goes for way more than it should. But, there are some steals too! OH, another idea – we keep a cardboard box in the trunk with bubble wrap (from stuff mailed to us) in there. Usually estate sale folks don’t have packing materials for delicate or small objects, so we bubble wrap and put in the box so they don’t roll around and get broken. Also: packing straps, string, duct tape – you never know when you’ll get something bigger that needs to be anchored in a myriad of ways. If you have physical challenges, don’t be embarrassed to bring AND USE a cane. Estate sale geography is often challenging – old, uneven flooring, rickety stairs, and yards that are not level. Be safe, not sorry. I’ve given in to using a fanny p;ack while at estate sales. It keeps my hands free, carries my tape measure and mini LED flashlight, and doesn’t violate the ‘no big bags’ rule. KIDS – check first to find out if the sale is kid-friendly. It’s not that people don’t like kids, but a sale full of kid-height tables of milk glass, or figurines, is often an accident waiting to happen. Sales will post this info on their estatesales.net page. Abide by parking requests. Don’t be That Person who doesn’t – you won’t win friends. ASK QUESTIONS. Is that cabinet you want in the garage which is closed off? Ask if you can pull your car up and they’ll open it for a few minutes. Some companies will take “bids” on items over $100 – you write down your bid, at the end of the sale, they get back to you and let you know if you won. Buying some really big pieces? Especially ones which are being used to display other items – the company may let (and often prefer) that you come back at the end of the sale and pick it up. Just DON’T be the person who doesn’t come back. GAH, more things I forgot. BRING – your smart phone, so you can look up that sewing machine model, or pinball machine, or whatever! Room measurements: I go a step farther. I keep a text file in dropbox (or you could put it on your phone) with all my room, window, and furniture measurements, and a folder with color swatches in it for approximations. DO – look under tables, benches, etc. And look UP! We tend to see what’s at eye level, or the bigger things. And rooms can be so packed that our eyes overload. Look at a room in “chunks” – don’t try and take the whole thing in. There’s gold in those baskets and boxes under and over things! I occasionally work with my in-laws who own an auction and estate sale company. We don’t do the half price the second day thing. My FiL’s approach is that if he can sell it to you at that price tomorrow, then he could sell it for that price today. Instead he gives everything a fair price and we start from there. That’s not to say that he’s as likely to dither with you on the first day as he is on the second, but we don’t try to insult people’s intelligence by jacking the prices up for the first day and the cut them in half on the second. Occasionally we do provide with help loading on the first or second day. However, since he’s in his eighties and has a bad back and knees, and I’m a heart patient, we usually hire local boys to help us and don’t try and do it ourselves. We also accept debit and credit card payments for purchases over $25. If you get a chance and are in North Eastern Kentucky look in on us. Where in NE KY. I have a house in Danville KY that I need to have a sell for its contents. Do you know of anyone who could conduct an estate sale in that area? Thanks in advance for your reply . I personally love rooting through peoples stuff. Every single house is a snapshot of personality from a particular time period and it always amazes me how many people have the SAME STUFF (Here’s a fun game, try and find the electric bread maker in every house… I promise its there somewhere.). Obviously you should be respectful (All the time everywhere BTW not just estate sales) but the idea of an estate sale shouldn’t bum you out, that’s just life. Take in the environment around you, see how people lived, see what they read and watched, see what stuff they used to organize, enrich and decorate their lives, see the heavily used and loved tools that probably built countless crafts. I feel like I have learned so much about people in general from the unique experience of poking around in their house. I have also been inspired into a ton of DIY projects from seeing all of the unique remodeling people have poured themselves into even/especially at the home of a low income family. Estate sales are one of the few times you actually get to SEE how people lived, raw and uncut and untainted by some reality TV agenda. Its even better if the estate sale is held by the family themselves because any trinket or treasure you bring up might provoke a quick history lesson or fond memory. If you live near a college town, you can score lots of FREE furniture on the last day of the school session. When my youngest daughter graduated from college, she had rented a trailer to take the bed we had given her to her new apartment. She was moving out of a furnished house, and her only furniture was the bed. While she had the trailer, she cruised the neighborhoods around campus, and furnished her entire apartment with furniture that the students did not want, or have the means, to take with them. You do have to be a little careful of upholstered furniture due to the epidemic of bed bugs, or even fleas, that might be lurking. I work for an estate sales company. Wonderful list! I would like to highlight #19. Please treat the workers at the sales with the same respect and consideration that you would like to be treated with. Also please do not throw things all over a room while digging for treasures. Every moment we have to spent straightening up the disaster someone left behind is time we do not have to spend helping our customers. And please be nice to the people working the sale. We are much more inclined to haggle and work deals with people who are happy and polite than with those that are mean and grouchy. And one last thing. If you go to a sale that discounts towards the end of a sale, remember that the one thing you just absolutely loved may not be there when the discounts go into effect. If you really love it then get it, otherwise it may not be around when you come back. If you only knew how many people have come back to our sales on the last day (when we have 50% off) and gotten mad at us (the workers) because “their” item had been sold. That’s when I’m always thinking “you should have bought it when you first saw it then”, although I never say it out loud. So if it is something you really love or are totally facinated with be prepared for it to have already been sold if you wait for the discounts to purchase it. Odds are if you loved it, than someone else did too! We hit the estate sales all the time and keep dibs on who has good prices and who is overpriced. If an estate sale company is consistently overpriced, we mark them off our list. Some people seem to forget that because an item is listed for $200 on eBay doesn’t mean it’s actually worth it! Agree! I always note the overpriced ones too – those are best on the last day! Well, i knid of held my breath before reading this because I’ve seen articles like this before with TERRIBLE advice (from the perspective of an estate sale conductor) … But this one is very good EXCEPT never, never, never mark anything sold on your own. We would take them off and ask you to leave OR have you pay for all those items immediately before doing any more shopping. Too often, people claim items without even looking at them carefully, and then when they’re all done shopping they start examining things and putting them back. Meanwhile, others who would have bought those items are gone and we’ve lost sales. Outr policy is “hold means sold” and we expect people to play nice with others. Also, in Illinois, the majority of companies take credit cards and cash … Some still take checks. Good point Kathy! I think it all depends on the area. I think it would be good to ask first – just to play it safe! So glad you liked my post – coming from an estate sale pro – it’s very high praise! I bring a large open top bag (its a 31 tote) with me to sales (unless the sale specifically says no large bags) after unloading it to pay I always flip it over and give it a shake so the person checking me out knows there are no stowaways, my bag is empty and they have peace of mind that all my items are paid for. Only once was I rudely questioned about placing items in my bag (what are you doing, your going to pay for that aren’t you) and the tone I was asked in determined how much I purchased that day as well as not going to any more of that company’s sales. There are nice ways to say everything and estate sale companies need to know that you will lose customers for being rude (and not just to that person, I witnessed the owner of a company belittle a woman about a price and I have never returned to her sales), being overpriced and that the regulars in the community talk to one another and readily share experiences. I’m in SE Michigan and there are usually at least 1-5 or more sales within 10 miles of my home. Wow, I guess I didn’t realize that the whole estate sale, yard sale stuff was a big business with all the rules ….do’s and don’ts ..lol . I grew up on yard sale clothing and items pretty much most of my life.. most of it being in small town America (Oklahoma). I always had to decorate my homes from the tidbits of lots of everyones leftovers…One thing I can say is that it kinda makes me proud, as I was talking with my grown kids just recently, is that as we were reflecting back on how I would always say things like “hey I got this whole outfit for 2 dollars” or something to that effect. My daughters told me first that back then they were always so embarrassed to have to wear the clothes I bought them (in hopes that it wasn’t from one of their friends house I got them from lol) but they said ” Mom you always did dress us cute & made our home feel homey and cozy no matter where we lived. 🙂 As a parent who worked hard all my life, and sometimes struggled at times to put food on the table..I gotta say that made it all WORTH IT. On another quick story I actually went to an estate sale way back when, bought a few items, one of which was what I thought was a vintage set of pearls. After I got home and was showing off my treasures to my family. I came to the pearls (which was the last item to show and that I was just only a little excited about. One guest that was visiting said “I think these pearls are real!!! ” I was thinking well no way…but I sure didn’t know nothing about REAL jewelry..but the kicker was that I DID know the family of the estate sale, you see I was a home health nurse and this estate sale was actually from one of my favorite patients that I had taken care of for a long time, that had passed!!! I still doubted the claim about the pearls but…I actually took them to a jewelry store for an appraisal…lol (didn’t tell my husband to be or anyone for that matter) I only paid 25 CENTS for the pearls and the appraisal was 35 dollars!!! Time went by and I actually forgot about them being at the appraiser . In the mean time i had even got married! (bought a pair of fake pearls to wear for 9 dollars )! !a few months passed and i got a call from the jewelry store to come pick them up(opps)…I was actually dreading to go get them…but I went got the appraisal and just very quietly opened the envelope…and what a surprise they were REAL and were valued at 1,270.00 …I laughed out loud and told my story to the whole store, but as I told it I began to feel terrible. I thought oh no I cant keep these I have to get them back to the owners, after all I knew them all and I would never be able to enjoy them knowing that the pearls may have been a big part of their family and just made it in the sale by mistake!!! The sale was huge and the sons were actually antique dealers etc..So without hesitation, I called them immediately and explained the situation. After a few phone calls they called me back and with great pleasure they said that those pearls were “Not Mommas” and that they must have picked them up along the way in their yard sale ventures and they just missed it…They congratulated me and said ” Hey that’s the thrill of the yard sale, and we couldn’t think of a better person to get them so enjoy”. So 16 years later my baby girl will be wearing them on her wedding day on Oct 18th. This is a great list of tips for shopping at estate sales! Don’t forget to also look for listings on EstateSales.org. They have a lot of sales that aren’t listed on other sites and they have great pictures also. I appreciate what you said about gathering up your items and asking for a price. It is a lot easier to get a better price when you purchase things all at once. It is beneficial for both you and them. Yes, having lots in your “cart” means for better prices! My number one tip for anyone going to estate sales is to buy what you like. (my thing is pretty dishes).I know that sounds silly, but often people get hung up on name brands and miss some really good treasures. Set a limit on what you want to spend & stick with it. And rather than trying to bargain, I just ask if the price is negotiable. I Love estate sales! Started going after we moved to TX, people love to collect and hang on to stuff. I have been able to furnish my home with beautiful things at a fraction of the cost. My friend is wanting to go and looking at estate sales this Saturday, and I am wanting to go with her but have never been. So I am looking for any advice on how to get the most out of this experience. I like how you said one thing that we might want to consider doing is a fast walk through, that way we can get the main items we want and then go back to see if there is anything else. This shall be a fun new experience! Thanks for the help! I’m attending my first estate sale tomorrow, and guest/shopping etiquette came to my mind. I sincerely appreciate the tips of Do’s and Dont’s. I’m just as intimidated as the next newbie, because I’m sure the early birds are the serious antique buyers. In the list of everyone’s tips, I must ask, is there proper attire? Certainly, it’s not a semi-formal affair, but what’s frowned upon? Oh, and how early may I arrive to line up? Do I wait for others, or just line up when I arrive? As a second-day/first-time guest, I’m not trying to outshop someone – just trying to get things done before the afternoon heat settles in. Wear what you’re comfortable in – it’s not a fashion show thankfully! If you arrive early enough to start the line – congrats! Ask your local liquor store for empty wine or whisky boxes. They have sturdy dividers which make them perfect for sets of glasses or other small breakable items. I feel sad shopping at these sales too and also wonder about my things when I’m gone. I tell myself that by then, it won’t matter one little bit to me . I love estate sales! I go every week or two. I am on a mailing list of a local Estate Sale company. I know the person well and she is very fair in her pricing and in giving “regulars” a better deal if you buy in bulk. I find the prices way better than our local thrift shops who price everything so high. It’s like they forget that all their items are donated but they won’t pass along any bargains to the customers. Give me an Estate Sale or Auction any day! Here Here – estate sales are where it’s at! I have just retired after being in the Estate Liquidation business for over 25yrs. I want you to know that your tips are the best, most realistic of any I have ever read. And I have seen tons! I especially appreciate that you took into account both the seller and the buyer. Many of my clients needed every dime we could make for them as they were paying for 24 hour care or funerals. Most of our items were priced so that buyers got a good deal even if paying full asking price. Then as you stated prices went down from there. Our goal was always to do our best for both client and customer. Thank you! Thanks so much Danna! Coming from a pro that’s high praise indeed! Wow…I just love your post, because each and every point explained in detail. You’re doing a great job. Keep it up.